A New and Living Way | Called Out: Now What? Origin of the church system. In Matthew 13, Jesus told a parable about a woman who secretly introduced yeast into three measures of fine flour. In scripture, yeast is always linked with corruption. I believe the fine flour here represents the person of the Lord Jesus Christ and His finished work. There are two spiritual women referred to throughout scripture, the wife of noble character, described in the Book of Proverbs and the harlot, described in the Book of Revelation. The woman in Matthew 13, I believe to be an insight into the work of the harlot, the “woman who rides the beast”. 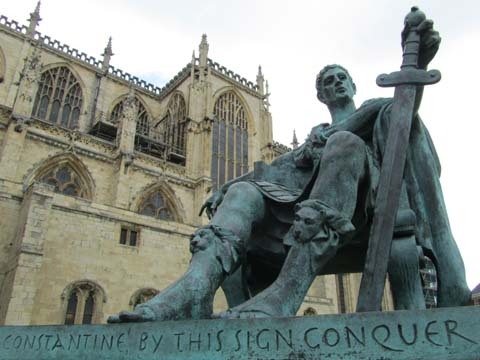 Constantine wanted a way to gain and maintain control of an empire. Introducing the church system into the finished work and person of the Lord Jesus Christ accomplished that for him. And so the church system was birthed in the hearts and minds of many of the Lords people and multitudes of pagans also. From its inception, the church system has been an unholy mix. Just like the rebellion of the northern kingdom of Israel, just two generations after King David, it did not take that long for Christianity to formally rebel against the Lord. The structure and operation of the church system. The structure and operation of the church system was modelled on the structure and ways of the Roman empire. People at the top who tell others what to do but don’t listen. People in the middle where there is often conflict between those who see the need for change and those who want to maintain the status quo. People at the bottom, many of whom seek some kind of relief from the drudgery and pain of their existence. The church system survives the reformation. The church system will always stop short of transformation. If the church were transformed it would cease to exist. The reformation transformed the way people thought about the finished work of Christ. It may have transformed the way people thought about the Roman Catholic Church. But it did nothing to change the way people thought about the church system, especially its clergy/laity divide. In many respects, by putting ourselves in the shoes of those early “protesters”, we can see how the reformation may have strengthened the idea that there are those who are of the clergy class and those who are not. With the reformation, we can see how the clergy was reinforced. Surely, the body of Christ needs men and women specifically selected and trained to know the scriptures sufficiently to keep us from falling back into false teaching? We can see with the reformation that although people came out of the Roman Catholic Church system, the system did not come out of them. The system did not die. The church system gets a makeover. In 1911, F.W. Taylor published, “Principles of Scientific Management”. His philosophy was simple; find the one best way to complete a task or solve a problem. Taylor’s principles were designed primarily for manufacturing industry to become more efficient. However, his goal was that his methods be used in every type of organisation. In that he was very successful. Today, we see “Taylorism” at work in business, health, education, social services, local government, the non-profit sector and the church. Everywhere we see men at work we see jobs broken down into the smallest possible tasks, people recruited, trained and rewarded to perform those tasks as efficiently as possible with all thinking, planning and decision-making carried out by suitably qualified and trained professionals. The success of Taylor’s work in manufacturing business not only strengthened the had of the system overall, it gave the system a whole new kind of credibility and powerful evidence for its justification. When we add to Taylor’s principles a belief in meritocracy, the idea that people achieve their position in life based on ability and effort, the system was effectively born again. What was seen as ugly and outdated is now highly attractive and the way forward. What was once seen as unfair and oppressive, is now holy and righteous. The church system cannot be transformed. In an effort to keep the church alive and growing, there have been many changes introduced in the last forty years or so. One such change was for the church to meet in homes instead of church buildings. In his book, “Restoring the Kingdom. The radical Christianity of the house church movement”, Andrew Walker describes the rise and fall of this change. After reading the book my conclusion was this; the people came out of the system but the system (its human ways and human thinking) did not come out of them. The church changed but the people were not transformed. They allowed the Lord to bring them out of the church buildings but they did not allow the Lord to form them into His ekklesia. I speak from personal experience. The main stumbling block for the church becoming the Lord’s ekklesia is that leaders don’t want to give up being leaders and the congregation don’t want to give up being the congregation. But in the Lord’s ekklesia there are no leaders and followers, there is no clergy/laity divide, we are all one. No formal use of power and authority. No routine or mechanistic ways of getting things done. But there is an abundance of continuous dialogue! The church cannot be transformed because people will not give up their reliance on the system to rely on the Lord. They cannot see how giving up our natural working can be replaced by the Lord’s supernatural working for two main reasons. Firstly, they believe the church and its underpinning system are the body of Christ and the work of the Holy Spirit. Secondly (consequently) any other way just does not make sense. Not even a new and living way. From about 1995 to 2005 I was part of a church in the U.K. During my last three years there I worked as a cell-group leader and a Pastor. I was also part of a senior leadership team. We were called, “The Living Way Church”. ← So, You’ve Come out of the Church.. Now What? Here is a new vid by Steve Dines explaining the structure and method of functioning of the Church System, vs that of the ekklesia. If we look at the Old Testament, whenever Israel sinned against the Lord, usually the nation of Israel was invaded by a heathen nation, as God’s wrath against sin. There was a time in northern England and probably in Scotland that a form of Christianity—Celtic Christianity—flourished. Celtic Christianity was very organic and not top-heavy with hierarchy and the traditions of men. This all changed at the Council of Whitby in 664 A.D. when the Roman Rite was chosen over the Celtic tradition. Just over one hundred years later, the first Viking raid happened in northern England. I believe the Lord allowed the Viking raids as punishment for following the Roman Rite.